Better late than never... here are the shimmers from OPI's Holiday 2010 collection, inspired by the movie Burlesque. 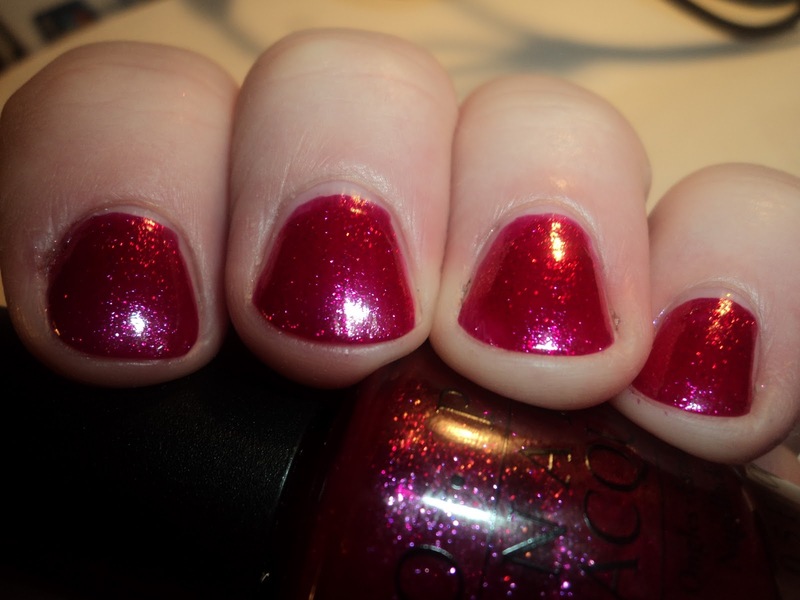 Ali's Big Break - bright pinkish-red jelly with golden and red shimmer. This is one almost exactly the color of candy apples, though it seems a tad pinker. The irregular shimmer is large and, due to the jelly base, it doesn't get lost. I found myself moving my fingers all around and staring at my nails. 3 coats. Let Me Entertain You - Bright fuchsia with golden and pink shimmer. Like Ali's Big Break, this one has the same golden shimmer. However, in Let Me Entertain You, because it's not a jelly, it gives the polish more of a metallic finish. 3 coats. Rising Star - Coppery-gold metallic. One of the more metallic colors in the collection. At first, I thought it might be dupey to OPI Bling Dynasty, but I was wrong. 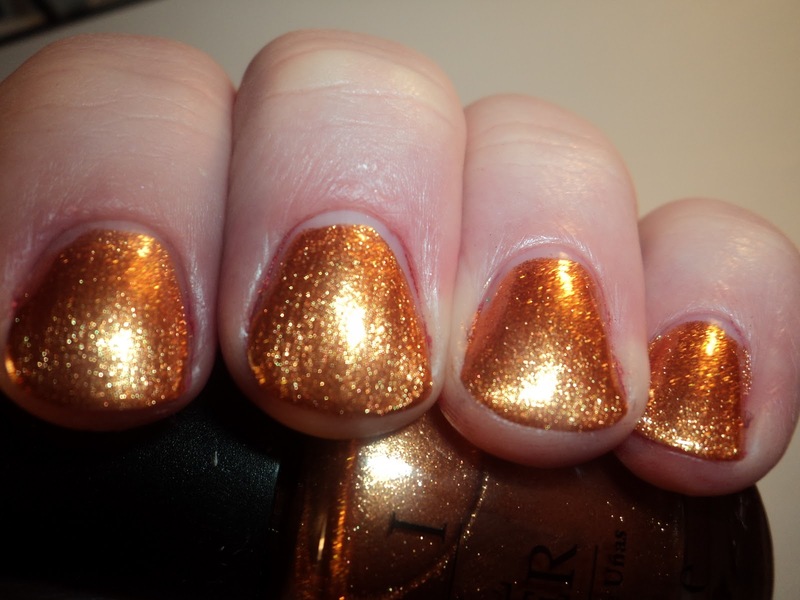 Rising Star is definitely more of a copper-gold, and doesn't have the pink and green shimmer of Bling Dynasty. Like all golds, I loved this one in the bottle, loved the color as I was applying it, but didn't really like it with my pink skin. 2 coats. Take the Stage - Rusty copper metallic. Like Rising Star, this one is of the more metallic colors. This one also has a fair amount of pink it it, as it looks like a happy marriage between a rose-gold and a reddish-copper. 3 coats. Tease-y Does It - Smoky plummy-brown shimmer with dark pink and golden shimmer particles. Unlike Let Me Entertain You, the shimmer in this one is very fine. I also find that it as a tendency to get lost in the base, unless you are in direct light. In the bottle, this one looks like it would a duochrome, but sadly, that doesn't translate to the nail. 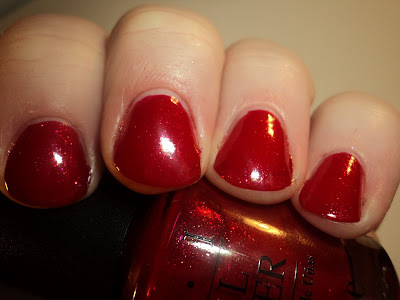 I know this is a favorite of many nail bloggers and MUA members, and I really tried to like it, but there is something about it that makes me not love it. 3 coats. 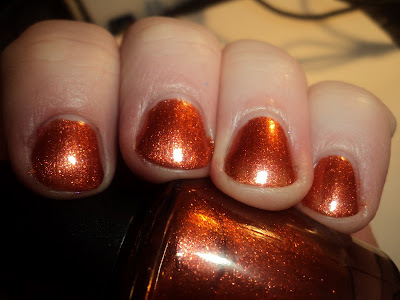 The Show Must Go On - Deep orange-pink/golden-slightly-coppery duochrome metallic. This one is most like Rising Star and Take the Stage in finish, with the only difference being the duochrome. Supposedly, it's similar to MAC Bad Fairy, but evidentially they aren't dupes. I wasn't able to snag Bad Fairy, as I was on vacation, but after seeing swatches, I think I prefer The Show Must Go On. I wore it as a full mani and couldn't stop staring at my hands. It's probably my favorite of this part of the collection. 3 coats. I know much of the buzz surrounding this collection was focused on the glitters, and yes, they are beautiful, but this part of the collection is no less awesome. For me, The Show Must Go On, Ali's Big Break, and Let Me Entertain You were real stand-outs, though I fully admit I'm probably broken for not liking Tease-y Does It. As for the formula, you'll notice that most of these were 3 coats. As someone that loves 2-coaters, polishes that require 3 coats to reach opacity make me a little nervous. 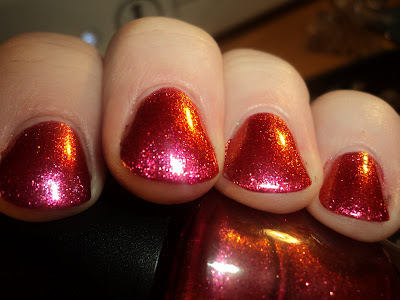 That said, the formula on these was as such that 3 coats was not a problem, and you will probably want to do 3 coats in order to reach full depth of color and shimmer. This collection is now available at salons, brick and mortar beauty supply shops, and online e-tailers. OPI retails for $8.50. Hopefully, I will have the glitter part of the collection up for you within the next few days. Ali's Big Break is very nice, but my favorite is definitely Tease-y Does It! Aurora, that's the general concensus with Tease-y Does It. I think I'm just broken. It seems very flat to me. I even wiggled my fingers like crazy out in the sunlight and I still didn't see anything special. I'm not ruling it out, because admittedly, there is something very mysterious about it, but as of now, I'm not in love with it. rising star is now a must have for me. argh. why must i have such a nail polish problem. i need them all. but i can only choose a few..boo being a student.haha. These are all very nice, but I don't feel like I "need" any of them...fortunately for my wallet.